Cool Artistic Treehouse Cabin Near South Congress Dist and Downtown! 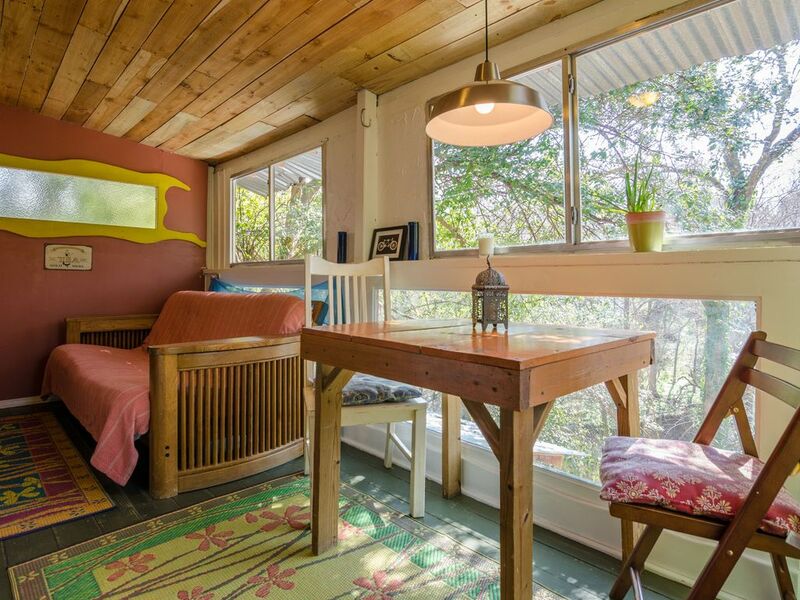 Known as the “Casita Roja,” our cool artistic treehouse is located in historic Travis Heights right in the heart of Austin, this vacation rental by owner is a dream for the individual or couple who long to have an ideal central location to experience the best of Austin. Furnished, very quiet two bed, one bath (+ one bonus bath) "treehouse cabin", rustic with a laid-back artistic flair, this nature bungalow has been home to many an artist in the past. It includes cable TV and wireless Internet. It's small, but very cool. The kitchen/living area overlooks a huge backyard waterfall and a forest in the middle of Travis Heights. The "Casita Roja" is surrounded by large trees and is a private as can be…most people say it reminds them of a place in the Caribbean. •	Kitchen includes a small refrigerator, microwave, toaster oven + a four burner electric stove top + coffee maker. Availability: Please check our calendar! We are a husband/wife team of fillmmakers who are lucky to live on such a cool Austin property! Our nature cabin/treehouse is one-of-a-kind. You won't find anything else like it in all of the city! It's definitely a "Keep Austin Weird" experience that everyone should try at some point. Plus the outdoor areas are so unique: winding stone paths, palm trees, cactus, stone walls, fire pits, a 3-tiered waterfall and pond. Even though we're located in the heart of downtown, you really wouldn't know it! We're far enough away from South Congress District to avoid the parking hassles, but still a short walk through the historic Travis Heights neighborhood to get there. Travis Heights is so different than other Austin neighborhoods. It's quiet and safe. No two streets are alike (no cookie-cutter houses) and it's situated on rolling hills filled with ancient live oak trees had us sold the minute we arrived. It's so close to downtown and within walking distance to South Congress shops and restaurants, yet it feels quiet and peaceful as if it's a small town neighborhood. Our street is great because it's surrounded by undeveloped woods and the rolling hills make are great for evening walks. For those that have dogs? Well, we're two blocks away from the best dog park in the city. Small living area with futon couch (Queen) and desk area. Please know that the host has this property listed on several sites and will not hesitate to cancel your reservation at his/her discretion. I booked this property three months in advance (Jan. for a three-night stay in April) and had my reservation cancelled THREE DAYS before arrival with a message stating that the property was booked on another site "back in December." So either the host found someone else willing to pay a higher price for their property (of note: the weekend was during a large event in Austin) or the host is so disorganized that he/she didn't realize a double booking for THREE FULL MONTHS. Either way, I was left scrambling to find new lodging on extremely short notice, for which I paid double the price of my original booking. Please save yourself the anguish that my husband and I went through and book elsewhere. Completely unacceptable. Absolutely loved this treehouse Super clean and just beautiful. Can't wait to come back! This review is a little surprising given that the guest knew we were dealing with seriously bad weather. This particular guest stayed with us during the coldest weeks in history for this area. The highs were in the 30's but the evenings were in the teens. That's not common in this area. Issue #1. The brutal cold temps caused the pipes (extending from the water heater) to burst, but regardless, we quickly replaced them. The problem took 6 hours to solve because the plumbers in the area were dealing with pipe bursts all over the city. Issue # 2. The guest didn't like the size of the TV. We replaced it with a much bigger one. Issue #3 She says it didn't look like the photos. Well, the place was photographed in the Spring but she stayed when it was the dead of winter when it was very cold and gray so of course it's not going to look the same. Issue #4 The heater had to "run all night". Yes, when temperatures are in the teens, heaters do tend to run all night. Overall, this review was unfair. We've never dealt with weather like we did in December 2010. Regardless of that, the Casita has a new bed, new kitchen and has be insulated even further to protect for below normal temps. No mater where you stay, It's always best to express your problems to the owner of the property. Give them a chance to make things right before you write an unfair review. Don't be passive and say "everything is fine" if it's not. We aim to please and if there is a problem, we'd rather address it on the spot instead of reading about much later. Being honest is key. Complaining about things after the fact is unfair especially when someone has already gone out of their way to make things right. My wife and I stayed here in August of 2010. Great location, we walked over to Congress every day. Real quiet at night. They were very accommodating for our canine companion even though she jumped in the Koi pond every chance she got. Even though we had lived in Austin previously, we never had a dog then, he thankfully pointed us toward Red Bud which was an amazing place to take your puppy for a swim! I had the pleasure of staying at Casita Roja for a week long stay in June. Upon entering the premises of the property, I felt transported into a different world like I was in the Amazon forest. The place is surrounded by a lot of trees. The sound of the waterfall from the backyard was very relaxing. It is very private and quiet yet so close to downtown Austin. You're not that far from the hike and bike trail or the restaurants on South Congress. The best part of the place is the porch. The porch has an AC which makes it possible to enjoy staying out without suffering the oppressive summer heat of Texas. My dog loved this porch! The owner, Andrew, was very helpful in answering questions and recommending places. He even allowed me to check in early. This place truly evokes the Austin spirit. 2 Bikes Available for Guest Use. Rates are subject to change until Reservation is confirmed. Special Event pricing applies for SXSW, ACL, and Formula 1 dates. Request a quote for your specific nights to find out exact pricing. Refunds are at the discretion of property owners and can only be issued if cancelled dates are re-booked.